Special Note: the first two chapters of this Librivox recording are repeated with different readers. For continuity of voice, listeners should select chapters 00a and 01a (but, as Librivox indicates, “variety is the spice of life”). When the meeting of the Martian Princess,Tara of Helium and Gahan of Gathol in her home city of Helium takes place, Tara is initially unimpressed, viewing him as something of a popinjay, and not much of a man, either. 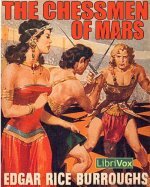 Later she takes her flier into a storm, loses control of the craft and the storm takes her far away from home to an unfamiliar region of Barsoom. After landing and fleeing from a pack of ferocious Banths (Martian lions), she is captured by the horrific Kaldanes, an intelligent non-human race like a crab in ap pearance, consisting almost entirely of a head with a powerful brain able to move with the aid of tiny legs. The Kaldanes have bred a complementary symbiotic race of headless human-like creatures called Rykors, which they can attach themselves to and ride like a horse. While imprisoned, Tara manages to win over one of the Kaldanes, Ghek, with her lovely singing voice. Gahan, having lost his heart to Tara, sets out to find her, only to get caught by the same storm. He goes overboard after a valiant rescue attempt of one of his crew. Through sheer coincidence he manages to reach Bantoom, the realm of the Kaldanes. He manages to rescue Tara and together with the disaffected Kaldane, Ghek, they flee in Tara’s crippled flier. Gahan, no longer dressed in princely finery and worn from his ordeals, is not recognized by Tara. In light of her earlier reaction to him, Gahan thinks it unwise to reveal his true nature and assumes the identity of a Panthan (warrior) called Turan. They manage to reach the isolated city of Manator. Craving food and water, Gahan as Turan ventures into the city only to find himself tricked and entrapped by the inhabitants. Soon after, Tara and Ghek are also captured. Manator subjects captives to a fight to the death in the arena in a modified version of Jetan, a popular Barsoomian board game resembling Chess; the living version uses people as the game pieces on a life-sized board, with each taking of a piece being a duel to the death. Throughout the novel, Gahan is forced to prove himself in the approved heroic manner of all Burroughsian protagonists in his effort to win Tara’s heart. As always, the heroine must be rescued from numerous perils and sticky situations.